Is object-oriented programming really all that useful? Check out this post on one developer's thoughts on functional programming and OOP. At Scalapeño this year, I argued in my keynote speech that the best and most unique parts of Scala are the ones suited to functional programming, including traits (when used for type classes, modules, and sum types), case classes (when used for product types), higher-kinded types, dot method syntax (which is useful for method chaining and namespacing), and various features of Scala’s type system. In the Twitter aftermath that followed, I further argued that object-oriented programming — by which I mean inheritance hierarchies (typified by the Scala collections inheritance hierarchy) and subtyping (beyond its use for modeling sum types, modules, and type classes) — isn’t useful. That is, it doesn’t have any real world practical benefits over functional programming. In this blog post, I’ll look at one of the responses and show how you can solve the same problem using standard techniques from functional programming. 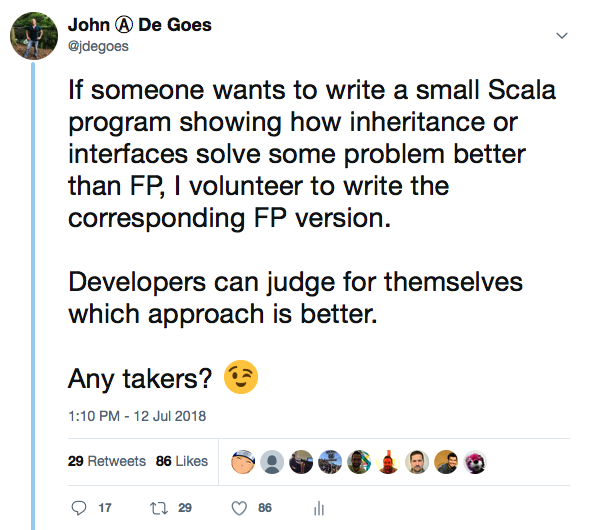 Then, every reader can decide for themselves whether OOP adds anything of value to what I have defined as the good parts of the Scala programming language. In any case, where we have a sum type, whose terms share a common piece of data, we can apply a refactoring: we can extract a new product type with the common data and push the sum type deeper as another term of that product. This demonstrates simple refactoring. Now, let's us not just vary the payload depending on the type of event, but let's have a compile-time guarantee that all events share common data. Compared with the object-oriented solution, the new data model is the same size (smaller in Scala 3.x! ), has all the benefits of the object-oriented solution and does not conflate abstraction (the capability to extract an id from a type) with the data model. The new data model is squeaky clean and contains no logic, which is better reserved for type classes because it’s far more flexible and precisely models the problem domain! Stay tuned for other posts in this series, where I look at other challenges problems. And, if you have some small, self-contained example and wonder how to do the same thing in functional programming, please post it in the comments below!